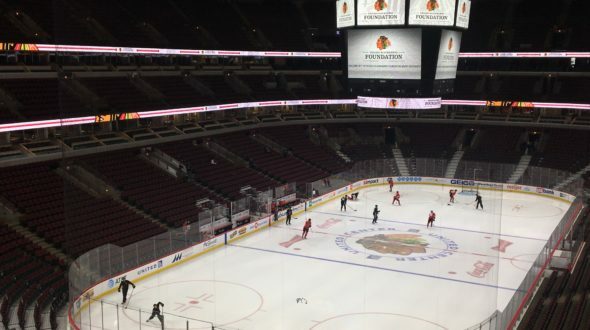 Urban Initiatives – Chicago Blackhawks Foundation Scores for UI! Chicago Blackhawks Foundation Scores for UI! Urban Initiatives is thrilled to announce that the The Chicago Blackhawks Foundation has granted us $50,000 for the third year in a row. We are so thankful for their continued support and know that their funds will go to great use for the Work to Play Program at Beidler Elementary, Otis World Language Academy and Faraday Elementary. Thanks to funding from the Blackhawks, 90 Work to Play participants will benefit from positive adult role models, active play, social-emotional and health lessons and of course, a nutritious snack at each practice and game day. Last week, two Urban Initiatives staff members were lucky enough to attend the Chicago Blackhawks Foundation Grantees Luncheon. This was a wonderful opportunity for Urban Initiatives staff to learn more about the organizations in Chicago that the Blackhawks support. These organizations are working to bring hope to the communities that make our city better and we are thrilled to have been included. Thank you, Blackhawks, from the Urban Initiatives team!